So, our first readthrough was on Thursday and it all went swimmingly well. There’s no doubt that as a director you pray that you’ve got the casting right and it isn’t until you’ve got everyone in the room for the first time that you know if that’s the case. A huge sigh of relief though! I’m pleased and releived to say that we’ve got an absolutely amazing group of people together. However, not this time. Everyone read well, confidently and we even got some laughs – unheard of at a table reading. I think the cast left feeling as excited about this project as I am. There seemed to be a real buzz in the air. It’s a relief to finally be off and running. There’s still plenty of opportunity to get involved if you fancy it. Backstage, marketing, prop making, stage managing, costumes …. there’s always plenty to do and it would be lovely for me, as a new boy, to get as much help from you all as possible. Contact me or one of the usual suspects. It’d be great to have you on board. 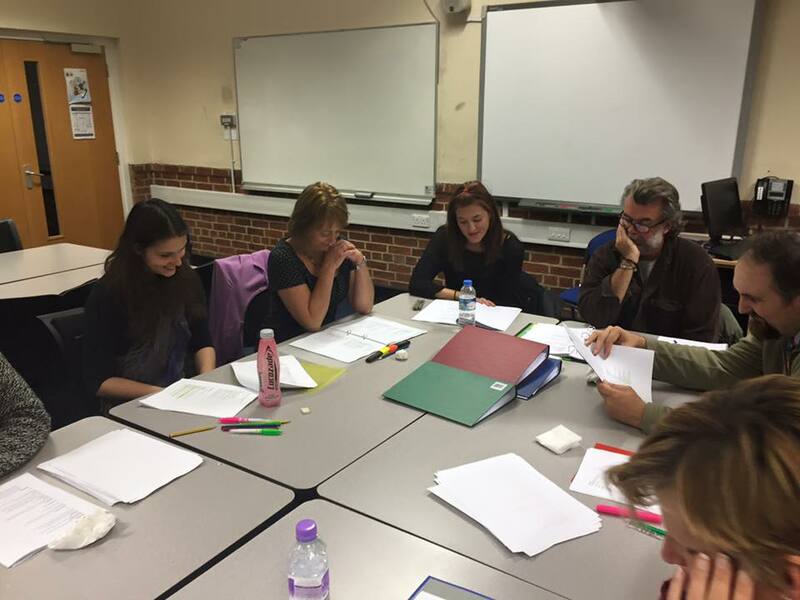 The Dream readthrough – smiling faces! Well, in true X Factor / Strictly style, we’re on a ‘journey’ and I guess it starts in earnest right here, although, of course, in reality, it started months ago! But more of that in blogs to come. So, why ‘herding cats’ as a name for this blog? Over the past 18 months or so, I’ve been part of the RSC Open Stages project and at a workshop in Stratford (get me, la-di-dah) someone described directing Shakespeare much like ‘herding cats.’ I think what they were implying was that it’s tough directing large casts and keeping everyone following the same artistic vision. Either that or he was attempting a very experimental production! Anyway, for want of a better name, that’s the reason why. Next week, after the AGM, which I’m assured you’ll all be attending (!) we’ll have a read through of the play, which will give me a chance to hear if the editing of the sacred script has worked and to meet you all, most for the first time. Then, the following week, THE AUDITIONS!!! Gulp!. For those attending, bring along a piece of Shakespeare . It doesn’t have to be from The Dream. Find something you’re fairly comfortable with. And if you can learn it that would be great. Auditions are notoriously nerve wracking and even more so if you’re not that experienced doing Shakespeare but fret ye not. I’m not expecting the next Gielgud or Dame Judi. We’ll have a bit of fun. Infact, that’s what I’m aiming to do with the whole production. Have fun, make it as accessible to EVERYONE as possible (actors and audience) and to produce a fabulous show. And let’s not forget …. IT IS A COMEDY! I’m really looking forward to meeting you all and super excited that I’ve been asked to direct this production. It’s going to be AWESOME!!!! PS I’m also looking for musicians as well as technical bods who might be able to help out with some pretty ambitious audio visual stuff. Also, anyone interested in helping with costumes and makeup?